This is a computer mouse cosy. He’s an albino because it was for a Mac. Click the image to take you to other pieces of craft that I’ve made. Forthcoming Book Making Evening Class! Ten week course at Howard Gardens School of Art and Design in Cardiff. Find out more and book a place: click here! The handmade book is an exciting and versatile form, which artists continue to be inspired by. 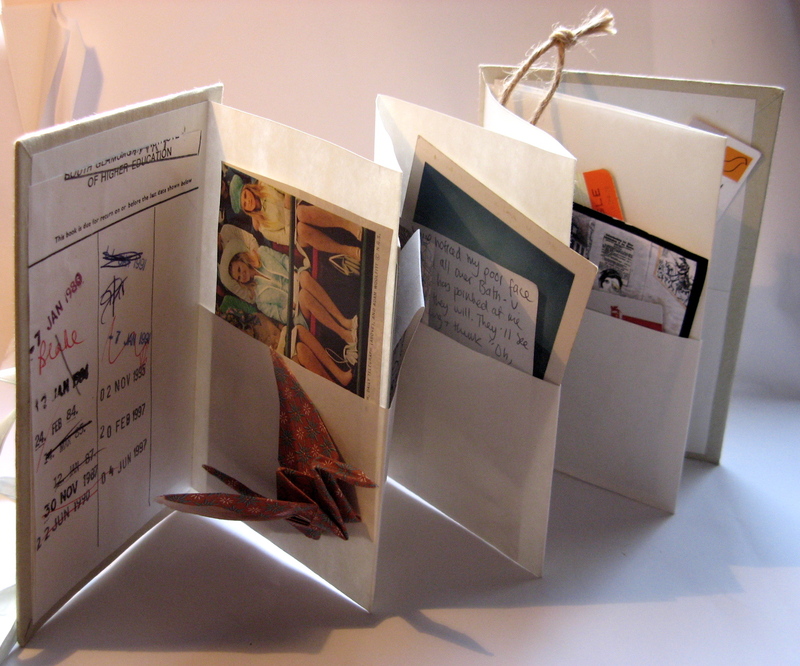 During the course you will explore a variety of folding, binding, covering and finishing techniques, with access to a collection of artists books to gather ideas from. Examples will include one-sheet books, concertina and pocket books, several stitched-binding techniques, and also more innovative and surprising ways to construct and finish your book. To develop your skills you will work on several inspiring projects, using a range of recycled materials, ephemera, papers and photographs to construct unique journals, albums and story -books. You will also have the opportunity to alter existing books and transform old pages into works of art. Drop me a line at sarie8 (at) gmail.com if you have any questions about the course. Please do pass this information on to anyone who might be interested. Looking forward to seeing you there.